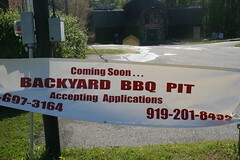 When we heard that the Backyard BBQ Pit was opening a new location, we BBQ Jews were excited and surprised (with an emphasis on the latter). And so we had to check it out for ourselves. Will there be another Backyard BBQ? All signs point to yes. The new Pit will be dug in the old Pizza Palace location. While it will likely be a win for barbecue fans (as long as the owners bring some of their wood pile north to Guess Road), it’s a bummer to see the Palace’s coffin sealed shut. After all, they made a decent pie and had a…swingin’ vibe. For us, though, it’s a fitting transition. The Palace was a real karaoke hot spot. By the power of “Copa Cabana” and “Sweet Caroline,” that means the spirit of Barry Manilow and Neil Diamond still haunts the building. And that’s appropriate as they’re both true BBQ Jews. (Well, at least they’re Jews).